Thunderwater Holts takes place at a Tropical setting. Palms, Jungle and an Ocean to play with. The elves living here are colourful pure-blooded and mostly easy going elves. Life has been peaceful, for the most part. There is a trolltribe close by they now and then interact and trade with. 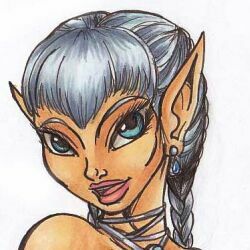 More of a problem is the human tribe who showed some hostility against the elves. The tribe: The Story:Crescent , Icebird! 2003 years old Immortal, Love/Lifemate: Deerprance, Kits: Flight & Lonerider. Currently he's on the boat with his chief. He has reddish hair and green eyes, and lightly tanned skin, and resents being the brother of Lonerider, who was mean to him as a child and shunned him as he grew older. He loves his lovemate Calliope dearly, and wants to lifemate, but isn't sure how to say it. Flight is a good runner, and is the fastest in the tribe, resulting in his name. He gets very angry whenever someone strikes a nerve, like his kinship with Lonerider or similar, and tends to sulk a bit when things don't go entirely his way. He loves kits, and doesn't understand why Eveningstar and Century's kit being outside of Recognition would bother anyone, and is a firm friend of his chief. Panther has very dark brown hair and almost black eyes, and is a champion archer. He is silent in his steps and conservative in his words, not angering but showing his point when he feels he must. He is very polite to everyone, but has a hard outer shell that only a few people who are close to him have been able to crack. His relationship with Rushingwater has no real love in it, it is mainly for the title, and Panther knows this. They are no match, they are opposites, but Panther lives in sin hoping that sparks will truly fly between them one day. 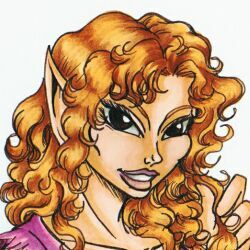 Seashell is the most beautiful one of the tribe, with brown corkscrew curls and bright green eyes, but she doesn't realize it. She is calm, modest and kind to everyone; she also shares a very close bond with her mother. Seashell is the devoted lifemate of Deepswim and the doting mother of Flitter. She has an uncontrollable habit of collecting seashells, to the point where Tanfall started making her clothes with pockets all over for her to fill. And each time she goes shell-collecting she always fills them to brim. Sometimes she even hunts them down on the sea floor. She makes the jewelry of the tribe, not just from seashells, but from coral, mother of pearl, feathers, and crystal shards. Jade has lightly tan skin, ebony hair and emerald colored eyes. He became chief at the young age of 66 when his chieftess mother was killed by a spotted cat attack against the holt. He grew to be a stern chief and detested pranks more than anything. When young Coralsand decided it would be fun to play pranks on him he grew angry and when he couldn't take it any longer he reprimanded her severely. This didn't solve anything except for Coralsand to become more attached to her stern chief. One night after Rumbleclam insisted on making him partake in a dreamberry eating contest with him he woke up in his den in the company of a decadent Coralsand. To his complete horror he had learned from Coralsand that he had just finished initiating her. Jade was not one to share the furs so easily, he had always wanted to wait until he found the one he loved and often went centuries without a single roll in the furs. They had decided to remain friends after that but not too much later they were sharing furs once more. However they stayed on a friendly level, not ever becoming anything more than that. Then one day she was gone. Sharktricker (Coralsand) had left against his advice with her brother Magpie, and Cascade to search for their friends Oceansong and Swiftflow during the season of storms. It was only after she was gone that Jade realized how much he had cared for the young pest and hoped that one day she returned home safely. And slowly, time has helped him move on. The past year, he adjusted back into the roll of chief and remained reclusive in the furs, still waiting to find the one he would love forever. One day a Tsunami hit the island he and his tribefolk inhabited. Everything was destroyed and nearly everyone dead save for him and 3 others. They immedietly set out to the sea to find some sort of shelter and safety. After a few weeks the group was seperated by a storm and he was left alone with Reefedge where they finally washed up on an island. Here we have another bunch of new adoptables for Thunderwater Holt. Stillmoon has black hair and silver eyes. She is has a slender build. She has a passive temperament and never opposes anyone for fear of a conflict. Quiet and reserved but she will, however, standup to anyone who is wrong in her eyes if it threatens the life of her or that of her kit, Tanfall. Stillmoon recognized Shadewater and the bond was set. Sadly, he died not even a year later, falling pray to a Blood Flower. 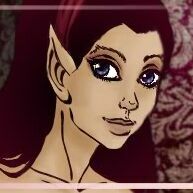 Stillmoon raised Tanfall on her own, not taking another mate during that time, because she did not want to forget Shadewater and the bond they shared. Bubble happened to be your average tomboy from birth. She prefered playing in the mud and looking after bugs with her father, then learning feminine ways of her older sister Foam and mother. Weaveweed had tried since the little girl was young to stir intrest in Weaving, but was rebuffed every time by the girls urge to follow her father into the ocean or jungle or whatever seemed to be 'fun'. Weaveweed eventually gave up, and let her rough girl be, after all, Bubbles older sister, Foam, seemed to be intrested in the loom. Being the youngest member of the tribe did have its disadvantages, as she is always being 'babied' and tries hard to break from that, even though she is just two hands and three. She can be very willful and stubborn, but always fun to be around.